Neer Dosa is a Mangalore breakfast dish. So easy to prepare breakfast within minutes. For this dosa no fermentation required. If you soak the rice overnight you could be able to prepare this dosa easily with in half an hour. This breakfast taste great with a spicy tasty side dish. You could eat this with any non vegetarian preparations. It tastes great with spicy tomato thokku (Onion tomato chutney) as an easy to make vegetarian option for morning breakfast. I have got this recipe from Vijay tv's Venkatesh Bhut chef's program. Tasty breakfast could be prepared without any effort. Even bachelors too make this dish easily in the morning. Soak the raw rice in water for about an hour. You could soak for overnight too. Grind the rice with coconut as a very fine paste. Transfer the batter onto a bowl and add salt and sugar. Heat a dosa tawa well and sprinkle little oil and pour (donot spread with backside of the ladle) a big ladle full of batter(If the pan is at right temperature you can hear the sizzling sound of the the dosa batter)from the outer side to inner (Refer here) and slightly swirling the dosa pan if needed to spread evenly. You can pour the batter by sprinkling with you hand too on to a dosa tawa. While making small holes will form which ensures the correct consistency of the batter. Cover with a lid (optional) and cook on one side till some spots or backside of the dosa starts to turn golden. Do not flip and cook the other side. 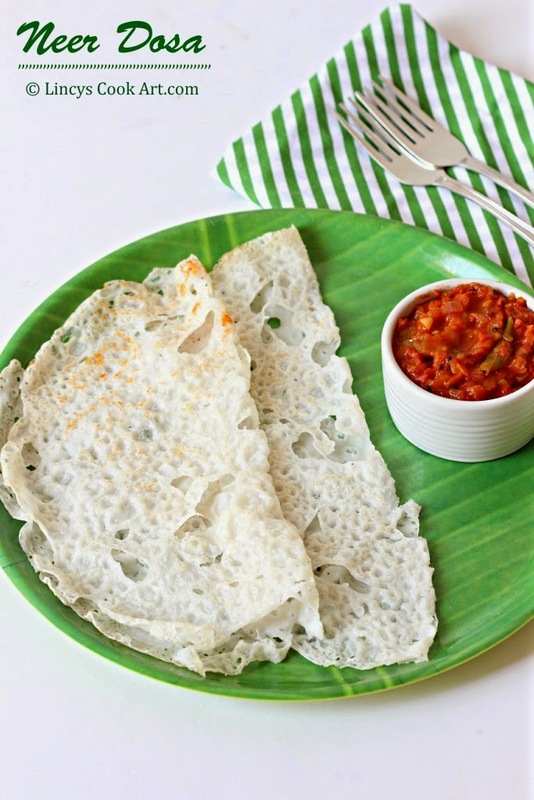 Checkout the tomato thokku recipe for an easy to make chutney which goes well with neer dosa. Notes: If the batter is thick holes will not form on the dosa. If the coconut is more the dosa wont stick to the pan. So dilute the batter accordingly before making dosa. Yummy Dosa and beautiful clicks as usual!!! Hi.. A quick question.. Which rice can be used? I have Sona masoori and idli rice. Any raw rice will do for this recipe. Use idli rice which i have already used.